We don't cover enough gluten-free recipes on (never home)maker. We'd had requests, so -- today's recipe is for you! I think we've already discussed how I don't like salad or pasta. But there's a rare exception to this rule. If the pasta is somehow a salad . . . I tend to like it. Especially if it's combined with some of my favorite ingredients. Namely heirloom tomatoes and fresh mozzarella cheese. OK. And when you add basil. I tend to LOVE it. Now, I've been seeing gluten-free pasta options popping up at restaurants around here more and more the past couple months. I think it's great. Most of the options are made from brown rice. The kind we used is no exception. 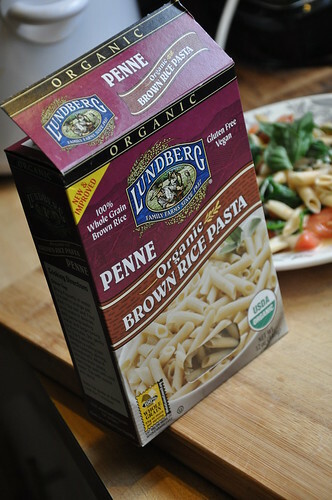 If you eat a gluten-free diet and are interested, you can purchase Lundberg Pastas at most natural foods stores. As a first-time eater, I found the texture and taste of their organic brown rice penne to be pretty much the same as many of the whole grain pastas I usually devour. So, GREAT! I didn't really know what to expect, but it wasn't weird or terribly different. And it cooked similarly. Cook pasta to the package directions in a medium stock pot. 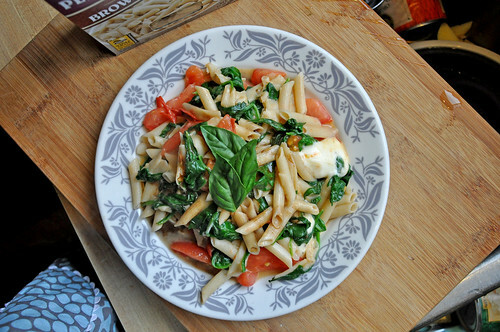 Bring water to a boil, toss in pasta and cook for between 8 and 10 minutes. Then drain and rise with cold water. Set aside. Slice you tomato and mozzarella. Toss into the colander where you drained your pasta. 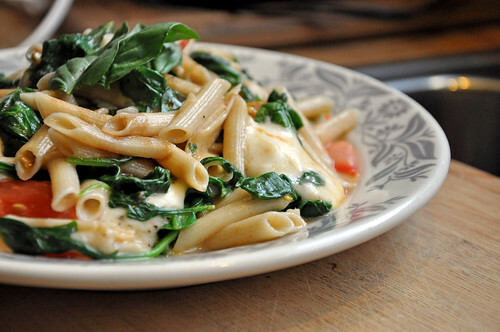 Put a tablespoon of olive oil in the used stock pot and toss in your garlic and spinach. Heat over medium heat and stir around until coated with oil. 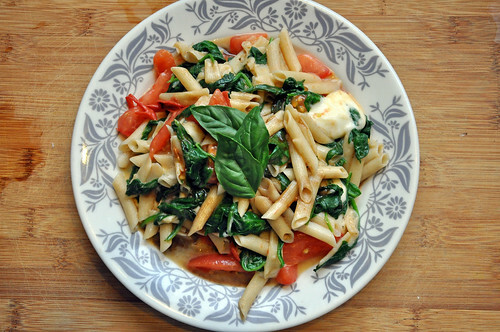 Then add your penne, tomato slices, and mozzarella. Turn the heat down to almost low. Toss around for a couple minutes until the cheese starts to melt, but is still in tact. Then serve. It's good with balsamic vinegar. Eat immediately. This recipe makes two generous lunch servings. Feel free to substitute in your favorite greens (I think kale would work beautifully) and other veggies.